Does anyone have any shopping recommendations for one of those infinity nursing scarves? Gift for my Sis who can be quirky so fun patterns or neutrals OK. Ideally spending $20-$30. Open to Etsy but it kind of intimidates me. TIA! Not sure of the difference between an infinity nursing scarf or a regular infinity scarf. I used the regular ones all the time while nursing — the key is big, soft, and some sort of texture/pattern to hide stains. Seconded re regular infinity scarf. Don’t get sucked in to paying extra for a special “nursing scarf”. A scarf is a scarf is a scarf. I love this…but I already have a diaper bag and they are so stinking expensive for bags I’ll carry for only a couple years. Plus, I kind of like that I can get away with carrying a brightly colored, graphic bag instead of a staid and somber purse because hey, BABY. This is a timely post! 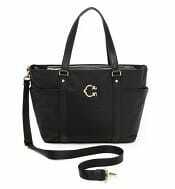 I want to ask for a new purse for Christmas and would love some recommendations. Since my daughter is now a toddler, I don’t carry a diaper bag anymore, so I want a purse that is large enough to toss in a sippy cup and a snack and maybe a diaper and some wipes. Needs to be leather, with a zip top and needs the type of handles that can be worn over your shoulder (but not necessarily a crossbody). I’d like to stay in the $200-$250 range since I’ll be toting sippies and snacks. I love the look of the new Pearl from Lo & Sons, but don’t think it is big enough. That is really cute and looks to be the perfect size. I’m thinking I need more of a neutral color, but this is a great place to start. Is the leather good quality? The leather is really nice! It’s fairly stiff and structured, rather than a soft leather like the Lo & Sons bag you mentioned, but the build quality is very nice. Even my dental hygienist was commenting on how nicely made the bag is when she saw it this morning! I’m scheduled for a c-section because my twins are breech/transverse. My doctor thinks I’ll probably go into labor before then, though (multiples often come before their due date). (1) If I do go into labor before the scheduled section, does anyone know if there’s a benefit to laboring for a few hours before surgery? I know hormones released during labor help with b-feeding and bonding. Does that apply if I don’t reach the middle or final stages of labor? (2) Did anyone transfer or attempt to transfer mucus from the birth canal to their c-section baby in the hopes of transferring their maternal microbiome? If so, how and when did you do it? I asked my OB these questions and she kind of gave me the industry standard answers; i.e., risk-averse. I think she views the micro biome thing as the newest fad. I can only speak to your first question. With my first pregnancy, I labored for over 12 hours, pushed for about 3 of those, and ultimately had a section. The recovery was brutal as I was sore from the labor in addition to the discomfort of the section. With my second pregnancy, I had a planned section (no labor) and the recovery was so much easier. My body did not feel like it had been hit with a mac truck the way it did with the first. So FWIW, I think you will have an easier recovery if you skip the labor. I didn’t notice a difference in bonding between the two, although I had more energy/less physical discomfort the second time around. I had a scheduled C-section, and I agree with T. McGill that everyone I know who had a scheduled C had an easier recovery than those who labored and then had an emergency C. And I don’t know about the hormones released during labor, but for me, I had the scheduled C and was able to do skin-to-skin within 30 minutes or so, and never had any trouble with b’feeding or bonding. A lot of hospitals have much softer and woman-friendly approaches towards C-sections now, so I wouldn’t worry too terribly much about missing out on all of the benefits of labor. I had exactly the same situation with my twins. I was scheduled for 38 weeks but that got pushed up to 37.5 wks when I had symptoms of pre eclampsia. My water ended up breaking 30 mins before being wheeled into surgery and the Dr estimated I was already give cm dilated. But the one big consolation of a c-section was no big contractions or pushing. The surgery was easy enough but I can’t speak to the ease recovery because I had post delivery complications (related to how big my babies and uterus were, not the c-section) that landed me in the ICU. I missed out on nearly all of the second and third days with my babies. While it was awful, it hasn’t impacted my ability to nurse and I have been exclusively breastfeeding. A tongue tie and painful latch ended up being far greater challenges. I did read the research on gut bacteria, but my Ob looked at me rather skeptically when I brought it up. And I never ended up pursuing it. I was also bummed that with twins you are unable to donate cord blood. I have an 11 month old. Over the course of this year he has been in 3 different daycare classrooms: the 6 week to 6 month class, the 6 month to walking class, and now the walking to 16 month class. How should I handle Christmas gifts to his teachers? Just to his current teachers? Or something to ALL 16 of the teachers he’s had in 2014? Egads this dilemma always stumps me. For that many teachers, I’d go with either small presents all around ($10-15 Starbucks cards?) with nice notes and call it a day. That’s a lot of class movement! Mine all stayed, more or less, in the same class for the year with kids similarly aged, so we only negotiated two classrooms (current and recent past) at holiday time. I have a similar issue, but only 2 classrooms. I did a big gift for the current teacher and more nominal for assistants/ old teachers. my thinking is that the old teachers now have other families/babies and will get larger gifts from them as they are the primary teacher. I’m doing (I think, not totally final but I’ve been noodling on it) $100 for current teacher, $25 for each of her 2 old lead teachers, $20-25 for each assistant (there are 3 that are shared between her old and new classroom) and $5 for the random floaters/assistants. Our daycare offers to pool the money for you, so all the teachers execpt the primary are getting their gift via the pool. (So– I write one check to daycare, tell them to split it $X to Teacher A, $Y to Teacher B, etc adn they pool everything together into one cash gift to each teacher). I like this because it avoids a float getting, say, 40 $5 gift cards to starbucks adn gives them instead $200 in cash. I’m in the same situation. I gave fairly generous teacher appreciation week gifts to her infant room teachers earlier this year, so I do not plan to give them year-end gifts (daughter moved out of the infant room this summer). Daughter was in the older infant room for only about 3 months, and then moved into toddler room, where she has been for about 2 months. One of her teachers moved with her. I’m going to get smaller gifts for the two teachers in the older infant room, and more substantial gifts for her current three teachers, who presumably will be watching her for the better part of the next year. I don’t know how much “substantial” means, though — I’m thinking maybe a $50 Amazon or Target gift card for them? I’m in a low COL area where cash gifts are not common, so I’m thinking gift cards will be acceptable.